Jonas was born in 1855, and Anna in 1858. They immigrated from Bolon, Sweden, in 1905 to the United States. Later they came to Winnipeg and then to Min­ nedosa by train and by wagon to the Hilltop district. They homesteaded N.W. 22-17-17W in the Rural Municipality of Clanwilliam. Jonas and Anna are buried at Hilltop Cemetery. They had six children, Mary, Clara, John, August, Nels and Bertha, all of whom were born in Sweden except Clara who was born at Lansing, Iowa, U.S.A.
Mary was born on December 23, 1883. She married Fred Johnson of Winnipeg. They are both buried at Elmwood Cemetery in Winnipeg. Clara was born on August 16, 1886. She married Ernest Ullberg of Hilltop in 1925. (refer to Ullberg, Ivar and Hedda). John was born on June 12, 1891, and he married Helga Sundmark from Hilltop in 1919. They farmed the S.W. 31-17-17W in the Rural Municipality of Clanwilliam. John and Helga retired to live in Erickson in 1951. John has since passed away. Helga presently resides at the Sandy Lake Nursing Home. They had one daughter Gladys. In 1950, Gladys married Lawrence Block and farmed her parents' farm until 1973 when they moved to Erickson where they presently reside. August was born on January 12, 1894. In 1919, he married Hilma Ullberg from Hilltop. They farmed on S.E. 22-17-17W. August and Hilma retired to the Village of Erickson in 1953. Hilma passed away on October 7, 1982, and is buried at Hilltop Cemetery. August presently resides in Erickson. They had two children; Ann born on December 14, 1920, and she attended school at Lund. Ann married Clarence Johnson in 1958. (refer to Johnson, Clarence and Ann). Wallace was born at Hilltop and received his education at Lund school. In 1953, he married Sylvia Byskal of Westmount district. They farmed the original farm of his father. Wallace was active in all community affairs. The Co-op Store, Pool Elevator, Credit Union, 4-H and a member of the Men's Curling Club and Rec Centre Comm. Sylvia is a member of the Ladies' Curling Club and the Hilltop Women's Community Club. They have two children; Ardelle was born on February 26, 1953, and attended Lund and Erickson schools. In 1974, Ardelle married Geoffrey Boughton of Arden, Manitoba. They presently live in Winnipeg. They have one daughter, Keri Lee. Clare was born November 11, 1958, and received his education at Lund and Erickson school. In 1980, Clare married Colleen Fischer of Bethany, Manitoba. Clare was a 4-H member and now teaching 4-H and is an active curler. Colleen is employed at the Royal Bank of Canada at Erickson. She served on the Executive of the Mixed Curling Club and is secretary of the Art Club. Mabel Neilson of Erickson. They reside at Erickson. Bertha was born on March 18, 1900. She married Charles Tidholm of Winnipeg in 1922. Charles was employed by the railroad. They lived in Winnipeg until 1959. After Charles passed away, Bertha returned to Erickson, Manitoba. They had one son Edward who married Evelyn Hipperson of Regina, Saskatchewan. They reside in Oklahoma City, and they have four children; Donald, David, Barbara and John. Editor's Note: August Larson passed away December 27, 1983. Per Erick was born in Norbake Falu Lan, Dalarne, Sweden, on April 14th, 1854. His wife, Anna Charlotta Erickson, was born in Vestanfois, Vestmanland, Sweden on November 16, 1852. Per lived in Smejebakken in his later years before he left for Canada. 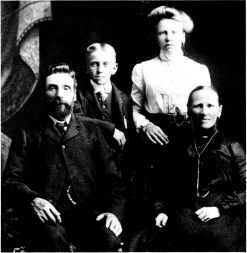 Per, Anna and their daughter Ida left Goteburg, Sweden on October 14, 1887. Peter and his family came as far as Minnedosa by rail. The Peter Larson Family. Peter, Emil, Hannah and Anna.